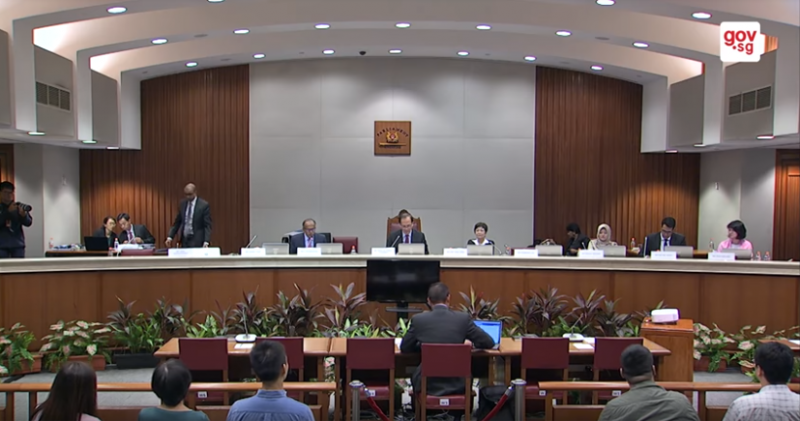 Screenshot of YouTube video during the Parliamentary committee hearing on “Deliberate Online Falsehoods.” Some civil society groups questioned why witnesses were subjected to intense interrogation during the hearings as if they were accused of doing something wrong. A committee was created  by Singapore Parliament in January 2018 to address the problem of “deliberate online falsehoods”, or disinformation  on the internet. The committee's mandate is to examine “causes, consequences, and countermeasures” related to the spread of disinformation. In a rare move for Singapore, the committee solicited the views of the public and held public hearings to discuss various sides of the issue. Alongside 170 written submissions , the committee received and heard the presentations of 65 individuals and organizations over the course of 50 hours of public hearings . Written statements represented the views of diverse groups which included media organizations, technology companies such as Twitter , Facebook , and Google , academics, policy experts, religious groups , civil society organizations , and even foreign offices like the Russian embassy . We heard how there is no one silver bullet and how we need a suite of different measures to address this complex problem, including public education, media literacy, fact checking, quality journalism, technology and legislation. We heard evidence about how current laws had limits of scope, speed and adaptability and why we need new legislative levers…Some witnesses were opposed to any legislation at all, even if today’s laws were inadequate in countering the harms posed by deliberate online falsehoods. Chong's summary touched on a key area of dispute, but did not directly acknowledge the committee's treatment of civil society members who oppose creating new legislation. Although a wide range of voices were heard, civil society members  who argued against new legislation reported  that they were “harangued, harassed, threatened and misrepresented” in the hearings. What I see are some activists and academics trying to give their views in good faith. But rather than being listened to like citizens representing the spectrum of political views in Singapore society, they are instead treated with sneering hostility, as if they were not witnesses giving evidence but the accused. It seems as if the effect is to intimidate those with contrary views from making submissions to the government in the future. How can this ever be good for Singapore? Some participants even used the hearings as an opportunity to directly undercut the work of civil society and academia. Singapore Community Action Network reported  that historian Dr. Thum Ping Tjin was questioned for six hours “over his work and expertise on Singapore history and whether there was evidence of a Communist United Front conspiracy in the 1950s and 1960s.” Although the historian had submitted recommendations on how to mitigate online disinformation, the committee did not ask or allow him to address these. The group also described  the committee's questioning of writer Kirsten Han, who is also a Global Voices contributor. Kirsten Han was questioned over an article she had written for an online news publication. It was suggested that she had presented a misleading picture within the article. It was not clear how this was relevant to the Select Committee’s Terms of Reference. The exchange ended with Committee member Edwin Tong issuing a veiled threat that Ms Han had “not yet” been sued or jailed. Some submissions to the hearings took a similar tack. A paper submitted  by the People's Action Party Policy Forum (affiliated with the ruling party which has been in power since the 1960s) focused mainly on refuting the December 2017 report  of Human Rights Watch about the decline of free speech in Singapore. It argued that the report is based on deliberate online falsehoods. Due process, public education…or a ‘fact-checking council'? While some maintain that Singapore's legal framework is already sufficiently equipped to address legal aspects of the issue, others (many of them lawmakers) argue that new legislation or regulatory measures are needed. It will be useful to establish a “fact checking” council, committee or body made up of diverse representatives to assess and thereafter designate ‘deliberate online falsehoods’ as specifically defined. This council should be independent, transparent and be able to react to emergent ‘deliberate online falsehoods’ quickly. It should include Singaporean representatives from academia, NGOs, civil society, including from the legal community, and other social groups that are representative of Singapore society. Its mandate must include identifying ‘deliberate online falsehoods’ and thereafter recommending appropriate remedial actions. The best antidote to “fake news”, or deliberate online falsehoods, is quality journalism – journalism that is accurate, objective, purposeful, credible and reliable. Legislation that restricts the investigative and reporting power of the media would hit the wrong target, as newsrooms already have rigorous and effective mechanisms to check and counter falsehoods. It might also inadvertently curb the media’s ability to fulfill its critical role in informing society, or to remain credible in the eyes of its readers. To prevent the measure from being overbroad, it is important that such restrictions must always be dependent on a judicial finding of that harm materializing. The involvement of the judiciary is a vital check and balance for this purpose. …the most important way to counter fake news is public education. Helping the public to acquire media literacy and learn how to spot fake news can counter their harmful effects in ways that legislation alone is unable to do…Such education should also be provided in schools and universities to enable young people to be more judicious in their consumption of media. …the biggest threat to the stability and growth of the democratic process in Singapore is the government’s control of the media and information. It urged the government instead to practice greater transparency. To combat falsehoods online or spread through social networks, legislation is not the way forward but a few steps back. The best way is to allow citizens to gain access to more sources of information and for them to develop a questioning and critical mindset on what is true or false, whether the information is from official or independent sources. I am opposed to measures that would give a sole body the power and authority to decide what content can or cannot be accessed by the population. It is my view that such censorship — enacted, for example, via executive takedown orders that would compel a social network to remove content — would curb freedom of expression and have a chilling effect on public discourse in Singapore. The Parliament will resume its deliberations about the issue next month.